At any moment, the built-in help system is available for you – simply press the F1 key. The Help System is context sensitive, which means that the help provided by the system is dependent on the specific action you are performing at the time. For example, if you press F1 key while entering detector data, a help for the detector data entry will be automatically displayed. You can, also, display the help contents by choosing the tab “Help” from the Angle ribbon and then clicking the “Help contents” button. The help window is shown in the next figure. On the left-hand side, in the “Contents” tab, is the hierarchical list of all help topics. Click on any item in the list to get the appropriate help text. You can, also, search help using the “Search” tab, or view and add pages to favorites using the “Favorites” tab. Help also contains an exhaustive list of frequently asked questions that we have compiled during the years of interaction with our users. You can see the Frequently asked questions section directly from the main screen with just one click. To do this, simply click on the “Frequently asked questions” button, which is located next to the “Help contents” button on the “Help” tab. 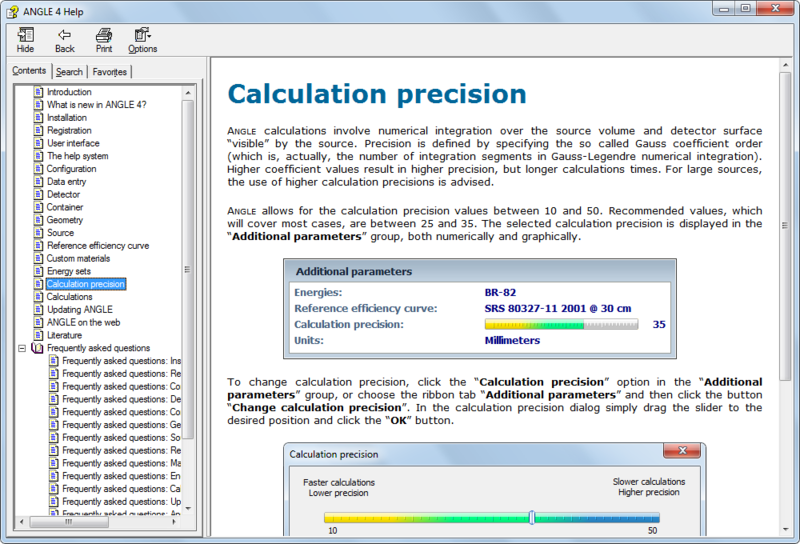 Next to the “Frequently asked questions” button you can find the “ANGLE 4 User Guide” button, which opens the User Guide in PDF format.